#Villa Famila is perfect for larger groups and family gatherings in Puerto Rico. Located in Palmas Del Mar, Puerto Rico’s most prestigious residential resort, Villa Familia is a large, comfortable, six bedroom, four bathroom, home with a private swimming pool that accommodates groups of 12 people. Palmas Del Mar, with its 1.5 mile long beach on the Caribbean Sea, two championship golf courses, casino, tennis club, health club, 15 restaurants, deep sea fishing and scuba center is the ideal spot for your next vacation. Lay back and spend your entire stay at “Palmas” or travel the beautiful island of Puerto Rico. The choice is yours, and on the fascinating east coast of Puerto Rico the location is perfect! At Villa Familia, gracious living spaces bring the outside in. The large private swimming pool surrounded by a terracotta tile patio with a large lanai provides shade for outdoor dining and relaxing, while Caribbean breezes waft gently through the entire house. This fully air conditioned home is newly redecorated and furnished. The home celebrates the bright colors of the Caribbean throughout. With ample seating and comfort seldom found in rental homes, it has areas for both conversation and watching TV. The large pool offers both gentle steps into the shallow end and depths of up to 6 feet. It’s a great place for adults to cool off and kids to play or learn to swim. A fully equipped modern kitchen includes: cook top, oven, microwave, blender, coffee maker, cookware, dinnerware and kitchen utensils sufficient to make preparing meals for twelve easy and fun. There is also an outdoor gas grill and a laundry with washer/dryer for your use. The kitchen island has seating for four. The media area offers a 32 inch flat-screen TV, DVD Player, cable service, Wi-Fi internet access. There is room for five sofas to be “circled around” the TV for family movie night. The master bedroom (reflected in the glass closet doors) is done in coral. It features a queen size bed, ample closet space, spa style bath with shower tub, sink and bidet en suite. The rain forest room offers a queen size bed, as does the Caribbean Sea Room. The citrus room offers a King size bed, ample closet space, and a view to the pool. Like all the bedrooms it is air conditioned and also has a ceiling fan. Two smaller bedrooms offer a day bed with trundle bed and are great for single adults or two children. The ocean room has direct access to the pool area with lovely windows over looking it. The day bed allows a bright daytime reading area, and the hidden trundle bed makes the room suitable for sleeping two. The Palm room is configured for sleeping the same way but has its own bathroom en suite. In the Villa Franca community, our home is among a quiet group of well maintained homes owned by local professionals, retirees and vacation home investors. There is ample off street parking for up to four cars. Palmas Del Mar offers more than one mile of beach with life guards and food concessions. From the house, the beach can be reached by car, golf cart or on foot. There are two 18 hole golf courses designed by Gary Player and Rees Jones. A tennis club facility with 14 hard courts, 4 clay courts and 2 Omni courts is also open to our guests, and as club members we can offer guest passes that discount fees for both golf and tennis. The resort also has stables for horseback riding, scuba, and deep sea fishing charter boats, a health club and 15 restaurants and more. Walkers will find miles of trails and paths throughout its environs. Bikes may be rented to travel about the resort, which can be great fun for kids and adults alike. While all aspects of the resort are accessible by car, golf carts are often rented to travel the resorts extensive network of dedicated trails. Using golf cart you can drive right up to the beach, go out to dinner or visit any area of the resort. We provide discounts for golf cart rentals, through a relationship with one of the resort Golf Cart vendors. Palmas del Mar is a wonderful resort with much to do. Even better, it is a short, easy drive from San Juan's airport (SJU),while near many wonderful Puerto Rico day trips, such as the forts and shopping in Old San Juan, off shore Islands and the El El Yunque Rain Forest Park. So, whether you stay in the resort and enjoy the many activities or chose to travel about, you'll have more activities to choose from than than you can possibly undertake in one trip! Here's the most important thing you need to know about Puerto Rico: It is both safe and friendly. Thousands of American's own second homes in Puerto Rico. Our family has purchased four vacation homes in Puerto Rico since 2000. We, and many others like us, have invested in Puerto Rico because it is very much like an American state. The roads are modern and paved; hospitals as staffed with Doctors trained in American Medical Schools; you can shop at Sam's Club, or Costco or Walmart if you chose. The primary language is Spanish, but many Puerto Ricans are bi-lingual, and many enjoy speaking English with their American guests. Reports of crime in Puerto Rico are completely overstated. Certainly there is crime in Puerto Rico. (Do you live somewhere where there is never any crime?) However, we have had more than 1000 guest parties at our four homes and none has experienced a crime. No one has been insulted or hassled or accosted. Puerto Rico is a common wealth of the United States. The island has a representative in Congress. Puerto Ricans are citizens of the US; and as a result, more Puerto Ricans live in the States than in Puerto Rico. Almost every resident of Puerto Rico has an aunt or cousin in the US. If not a bother, daughter or son. Hundreds of thousands have served in the US military. They are proud to be Americans and they like Americans from the States. So, when you go to Puerto Rico, expect to be treated well. You will be. Palmas has a 1.5 mile beach on the Caribbean. As members of the private Beach Club, we provide access through guest passes to you. Our home has its own private swimming pool. Located in the most beautiful resort in Puerto Rico, Villa Familia offers golf, tennis, 1.5 mile Caribbean Beach, private pool at home, Beach Club, horseback riding, and charter boat fishing. Villa Familia is a great place. Villa was clean, well kept and fully equipped. It satisfied all our needs. We had a great weekend. Thanks very much for your positive review. We have worked very hard after Hurricane Maria to bring the home back to the rental market. You are the third group to enjoy Villa Familia since we began to rent it again. All had a great time at Palmas Del Mar and said that they enjoyed the home very much! It is nice to see Puerto Rico back to normal after the awful hurricane. Palmas del Mar was a real pleasure. We enjoyed many sunny days and wonderful times at the big beach. We took up the owner's offer to visit the Beach Club pools and our kids had a great time on the slides and we enjoyed the beautiful scenery all around. The home had a newly renovated pool which was beautifully done; the kids lived in it. We found the home well equipped, nicely located and very comfortable. Palmas Del Mar has two great golf courses and we played a few rounds. (We recommend starting early as it does get hot midday; better to be on the beach then!) We'd like to come back again next December...it's a great month in Puerto Rico. Puerto Rico and Palmas del Mar are once again a great place to vacation! It's good to have things back to normal and folks enjoying our home. Palmas Del Mar = Great! Our group had a great time at Villa Familia in Palmas Del Mar, Puerto Rico. We found the house large and comfortable and spent many hours enjoying the private pool in the backyard. Palmas del Mar is a magical place. We walked miles through beautiful communities and amazing landscaping. We went to the long and beautiful beach, visited the pterocarpus forest enjoying it’s boardwalk tour of nature, had dinner at great restaurants all without leaving the resort. But that was just the beginning of our great vacation. 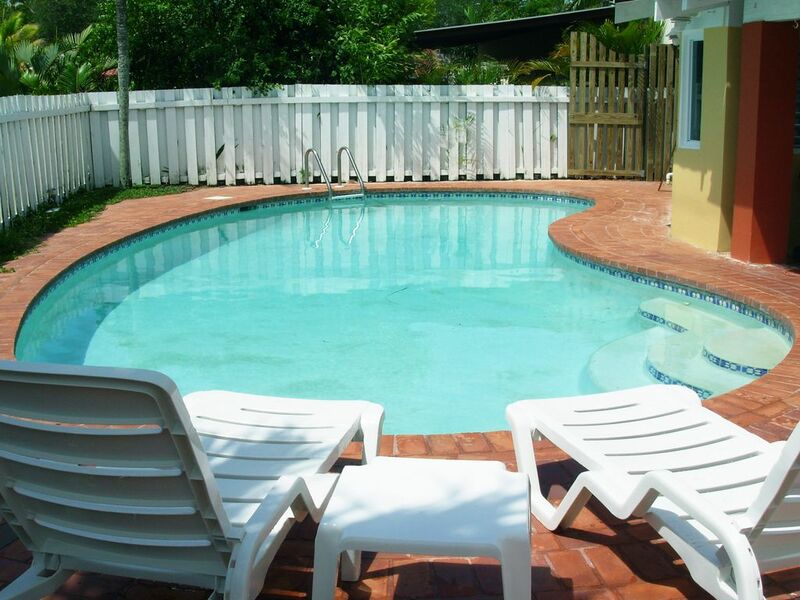 Villa Familia is wonderfully situated to get a fast start to many other locations. We enjoyed the art at the San Juan Museum of art (very contemporary and most exciting); roamed about Old San Juan. Toured the Serralles Castle in Ponce. Swam in Rincon. Kayaked in the Humacao Nature Preserve. Visited the Camuy Caves and the Radio Telescope project on the same day. And had a very special eco tour of the Las Cabazas de San Juan Nature Preserve in Fajardo. As women traveling alone throughout PR, we were most impressed with the positive welcome we received everywhere and how comfortably we felt moving around on our own. I can’t wait to return to PR. I would definitely stay at Villa Familia a second time. It’s a great place to see PR from! Thanks for your review. You make a great point: while Palmas is a special place, there is much to do in Puerto Rico outside the resort. Our home is a great place to kick back and relax, but also very convenient to many other great venues. So, in our view, guests should plan to see the whole Island. We had a great time at Villa Familia, the home was just as described on the website (VRBO). There are plenty of things to keep everyone in your group busy in the Palmas del Mar community. There is so much to do outside of Palmas as well. The only drawback we found on the property was the beach was smaller than expected, but we found awesome beaches nearby. The home has everything you need for a day at the beach (chairs, towels, coolers). The home itself is very roomy, we were a group of 12 and didn’t feel crowded in at all. We went during an unusually busy week so we were unable to rent golf carts to get around the property (not necessary but cool), so I would recommend you make reservations in advance for things you really want to do, especially for larger groups. You will need more than a week to do everything you want to do since there is so much to do on the island. Already planning our next trip. If you have children or enjoy a resort like atmosphere, the beach club is a must. It was a real plus to get Beach Club passes when we rented Villa Familia. Our group used them to play tennis at a discount, visited the health club for morning workouts, and we all enjoy visiting the beach club for several of the days we stayed at your house. Thanks so much. The walkers in our group really enjoyed strolling the mile long beach every morning and the two golfers among us played the two different golf courses, enjoying them both. We found the house comfortable and large enough for our group. Using golf carts we could go from the house everywhere in the resort and several evenings traveled through the balmy air in the carts for dinner out. For me sitting outside with my morning coffee by the pool in a T shirt and shorts was enough reason to come back next year. Nice house, great resort. Thanks again. It seems more young professionals are traveling as a group including several parents and kids of all ages. Our home with comfort for 12 and a private pool fit this need to a "T" . Palmas del Mar has dozens of activities, including golf, tennis, beach club, beach, horseback riding, deep sea fishing, plus great walking and 15 restaurants of varying styles and cuisine. We're glad you enjoyed so much of it and plan to come back! Villa Familia was a wonderful surprise! Much bigger than we thought it would be. Well equipped in every way and easily accommodated our group of 12. We loved the decor and the fact that there was comfortable seating in the living area for our large group. Having a pool outside the back door was a special treat…the teens in our group "lived in it!" We had great weather and enjoyed walking to the beach whenever we could. Palmas has extraordinary architecture and plantings, so walking was both a feast for the eyes and great exercise. We ate at three different Palmas restaurants and cooked in three other nights. We found the supermarkets up to American standards, but also enjoyed buying mango, papaya and pineapple fresh and ripe! Our vacation was a terrific break from the hard New England winter we are having. Thanks for sharing your lovely home. Having a six bedroom home on one floor is a a great treat for a large group. Often larger groups must book several small condos in the the same complex to be together. At Villa Familia, everyone can be in the same place and dine together with comfort and space. It's great fun to cook the meal together whether on the pool-side gas grill or around the kitchen island. Everyone gets to talk and laugh and participate, but of course your bedroom is just a few steps away. No elevators, no steps, no running back and forth for the things you forgot. Villa Familia is a rare find inside Palmas del Mar. Thanks again. We offer guest passes to the Palmas Del Mar Country Club facilities. This includes weekday access to the exclusive Beach Club; discounts for golf and tennis and access to the health club. 4 Night stays may not be available during peak seasons.